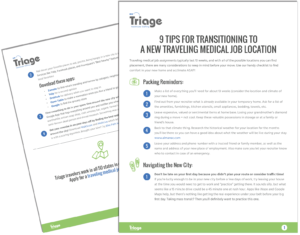 Traveling medical job assignments typically last 13 weeks, and with all of the possible locations you can find placement, there are many considerations to keep in mind before your move. Use our handy checklist to find comfort in your new home and acclimate ASAP! Make a list of everything you’ll need for about 13 weeks (consider the location and climate of your new home). Find out from your recruiter what is already available in your temporary home. Ask for a list of the amenities, furnishings, kitchen utensils, small appliances, bedding, towels, etc. Leave expensive, valued or sentimental items at home base. Losing your grandmother’s diamond ring during a move = not cool. Keep these valuable possessions in storage or at a family or friend’s house. Leave your address and phone number with a trusted friend or family member, as well as the name and address of your new place of employment. Also, make sure you let your recruiter know who to contact in case of an emergency.